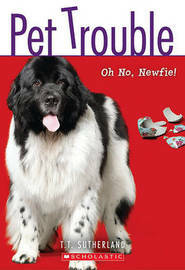 The 5th book in the hilarious series about adorable pets that just won't behave -- fans of Marley & Me and The Dog Whisperer will love getting into Pet Trouble! Heidi always thought that she was energetic enough for any dog. She loves to play and run around and wants a big, enthusiastic dog to play with her and love her. But Yeti the Newfoundland might be a little more love than Heidi bargained for. He's HUGE, and massively furry, and everything he does -- jumping, wrestling, flopping -- makes the whole house shake. Heidi loves Yeti, and she loves how much he loves her ... but is there really room enough for both of them?